"Sampath Speaking" - the thoughts of an Insurer from Thiruvallikkeni: Dustin Brown goes down fighting ~ wins fans for dreadlocks !! Dustin Brown goes down fighting ~ wins fans for dreadlocks !! Wimbledon 2017 is on ~ an astonishing dive return from a German on Wimbledon's first day has already become a strong contender for shot of the tournament. Dustin Brown, 32, performed the breathtaking volley while beating Joao Sousa of Portugal 3-6, 7-6, 6-4, 6-4 in their first round match. Though touted as challenger, he did not bother Andy Murray much, making Britons happy. Andy Murray left another of the more flamboyant players in the men’s game in his wake. Forty-eight hours after disposing of Alexander Bublik, the world No 1 brushed aside the challenge of Dustin Brown, winning 6-3, 6-2, 6-2 to secure a third-round meeting with yet another entertainer, Italy’s Fabio Fognini. Murray has never failed to reach the third round here and never looked in danger of spoiling that record. Brown beat Rafael Nadal here two years ago, but the world No 97 rarely troubled Murray. The 32-year-old German has a highly unpredictable game, hits more drop shots than probably any other player and can also strike the ball with great power. Murray, however has never lost in a Grand Slam tournament to a player ranked as low as Brown and disposed of him with a thoroughly professional performance. With his net rushes, slices, drop shots and thunderous ground strokes, Brown can upset the rhythm of many players, but Murray coped admirably, even if the German looked threatening in the early stages. 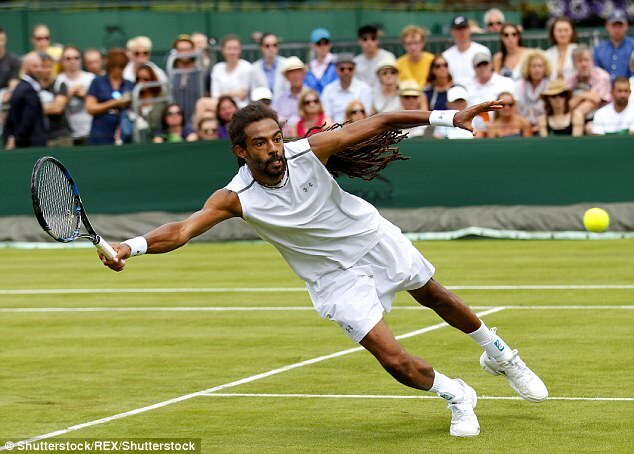 Dustin Brown, is a Jamaican-German professional tennis player. He rose to fame after beating Rafael Nadal in the 2014 Halle Open and Wimbledon 2015, and is known for his technique, speed and entertaining playing style, often entertaining the crowd with trick shots during matches. Dreadlocks, also locs, dreads, [in Sanskrit, Jata] are ropelike strands of hair formed by matting or braiding hair. Dreadlocks can also be formed through a technique called "twist and rip", as well as backcombing and rolling. Various methods are used to encourage the formation of locks such as backcombing, braiding, rolling and the crochet hook method. In olden days, traditionally, women used to sport long hair; school girls would have double plait, a complex pattern formed by intertwining three or more strands hair and wearing dhavani ~ half-sarees ! !~ not any longer..!! ~ no point in discussing whether the hair possesses natural fragrance… In one of the earlier World Cup (FIFA) remembered Valderrama – mainly because of his hairdo ….. 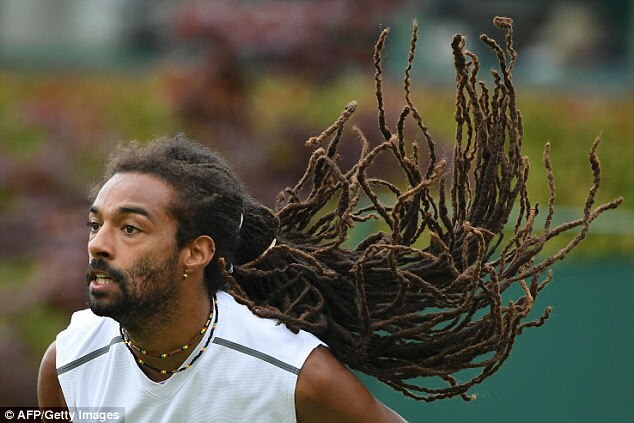 The German Dustin Brown who made an incredible dive return - and pleaded with Andy Murray fans not to BOO him sports a dreadlock. The German is a dying breed of serve-volleyers and his all-action game is always entertaining. It is reported that the 6ft 5in athletic star's hair was last cut by his mother in 1996, with his spectacular dreadlocks earning him the nickname Dreddy. Do you still remember the Dhoni advt featured in Star Sports - where hairstylist Sapna Bhavnani tried to convince Dhoni sport different hairstyles – one of which makes Dhoni say, ‘pathar marenge road pur log’ that people will throw stones ! Finally, Sapna comes up with the idea of giving Dhoni the same look that he sported during India’s triumphant WT20 campaign in 2007 – the long-hair look.